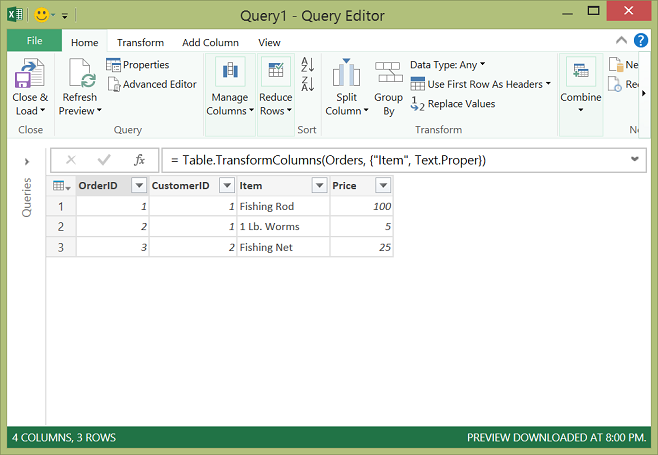 This quick tour describes creating Power Query M formula language queries. M is a case-sensitive language. To create an advanced query, you use the Query Editor. A mashup query is composed of variables, expressions, and values encapsulated by a let expression. A variable can contain spaces by using the # identifier with the name in quotes as in #"Variable name". Create a series of query formula steps that start with the let statement. Each step is defined by a step variable name. An M variable can included spaces by using the # character as #"Step Name". A formula step can be a custom formula. Please note that the Power Query Formula Language is case sensitive. Each query formula step builds upon a previous step by referring to a step by its variable name. Output a query formula step using the in statement. Generally, the last query step is used as the in final data set result. To learn more about expressions and values, see Expressions, values, and let expression. Let's assume you created the following transform in the Query Editor to convert product names to proper case. Let’s review each formula step. Orders – Create a [Table](#_Table_value) with data for Orders. 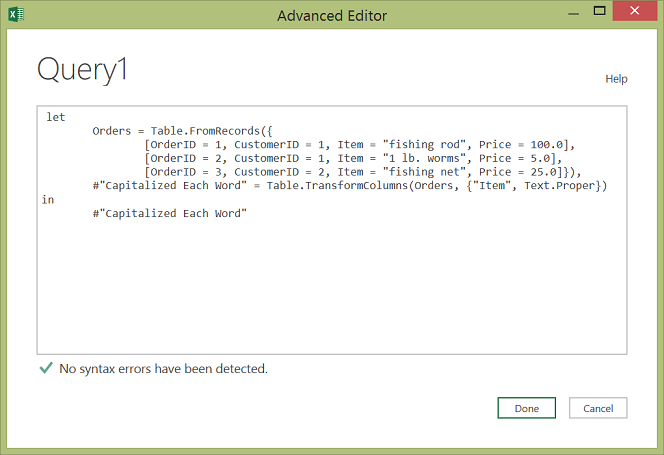 #"Capitalized Each Word" – To capitalize each word, you use Table.TransformColumns(). in #"Capitalized Each Word" – Output the table with each word capitalized.